1985 – Started my first radio show with a bunch of good friends. It was called the All Out Cricket Show and it was about the humorous side of cricket – only it wasn’t particularly humorous, so it only lasted a couple of years. Still, it was great fun and we got free tickets to the cricket. 1986 – Wrote comedy for the Australian Broadcasting Corporation – and got paid! Yay! The band Keith and I formed became the Grownups at about this time. We were moderately cool for a little while. Yay. 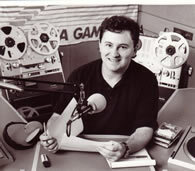 1987 – Started work at Radio Australia where I spent 10 years behind the microphone talking about sport, music, the environment and the Pacific. When I did my first live read, I was so nervous I could hardly see my script. Scary! 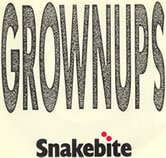 My band, the Grownups, released our first single – Snakebite. 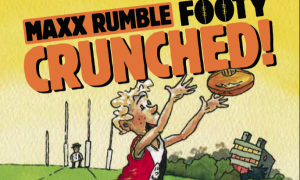 1988 – What a big year this was! 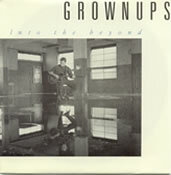 The Grownups released our second single, Into the Beyond. According to the charts in a magazine called Juke, this was one of the biggest selling independent songs in Australia for the year! YAY! 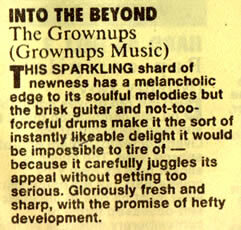 Our single got a nice little review in the Melbourne Age. Travelled overseas for the very first time, spending 10 weeks in Europe and Egypt. Yay! 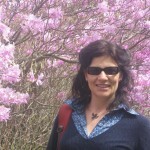 Started dating the beautiful and talented Jane Godwin. Jane is also a children’s author. Google her and you’ll see how many great books she’s written. Go on. Don’t be afraid. Oh, but finish reading this first. 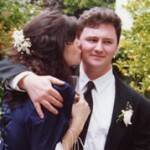 1989 – Married my beautiful and talented girlfriend, Jane Godwin – she was my fiancee by then. Yes! 1990 – Jane and I had our first child – a beautiful and talented boy called Will. Lots of yays all in a row. Won a World Environment Day (WED) Award for my environment show on Radio Australia. The show was called One World. Yay! 1991 – Kicked back and spent the year dining out on my WED award. 1992 – Jane and I had our second child, a beautiful and talented (and sleepy) girl called Elisabeth (or Lizzie). Many, many yays! 1993 – Very tired this year. Two young children. No sleep. Exhausted. Going crazy. Ay-Karumba! 1994 – Decided to try my hand at creative writing. Bought an exercise book. Opened it up on the kitchen table and stared at it. Oh no! I had nothing to say – not a word! Eek! After a while, maybe days, I thought of something to write. Phew! 1995 – Kids growing up healthy and strong. Here’s Wil playing a game of corridor cricket – a game my friends and I invented when we were kids. In this picture we’re using a ruler for a bat and rolled up paper for a ball, but there are many exciting variations. It looks like Wil has just belted someone for a six. I hope it wasn’t me! 1996 – Left the Australian Broadcasting Corporation after 10 years. I felt I’d worked in radio for long enough. I wanted to concentrate on writing. Started working for myself. 1997 – Wrote the script for an Australian animated feature film, The Enchanted Billabong, that didn’t quite get made. But at least this song for the film, which I wrote with a super talented fella called Craig Bryant was recorded. 1998 – Wrote a couple of episodes of an animated TV series that DID get made – Old Tom (produced by Yoram Gross). 1999 – Did lots of copywriting and media production. Other than that, I partied like it was 1999 – which, of course, it was.